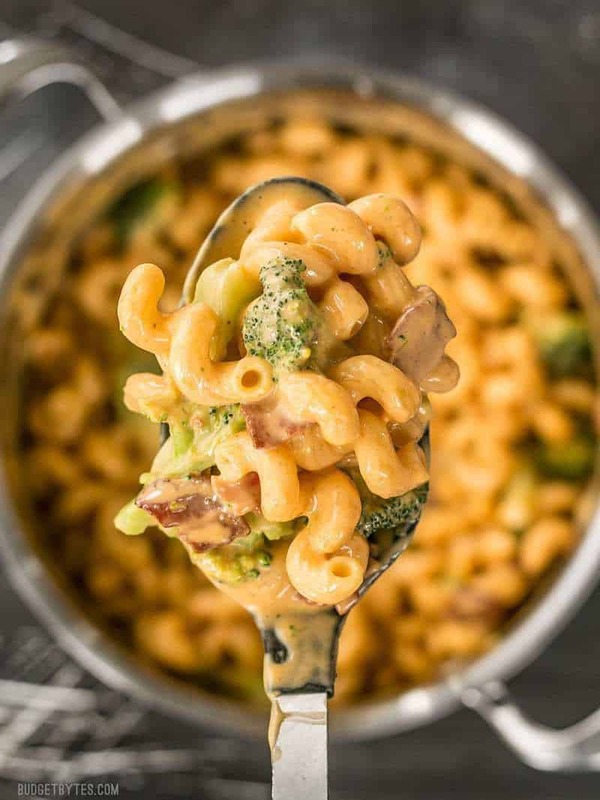 I first tried this evaporated milk cheese sauce method a few weeks ago when making the skillet macaroni and cheese recipe from Daniel Shumski’s book, Will It Skillet? This super fast, easy, and absolutely fool-proof method of creating a smooth and silky cheese sauce is my new favorite. So this time, I swapped out the butter for bacon fat, changed up the seasoning, and added broccoli and crumbled bacon. The result was fantastic. But do I really need to even say that? BACON. Author: Adapted from Daniel Shumski // Will It Skillet? Prepare the ingredients before beginning because the process goes quickly once it's begun. Thaw the broccoli florets and chop them into small bite-sized pieces. Slice the bacon into small pieces. 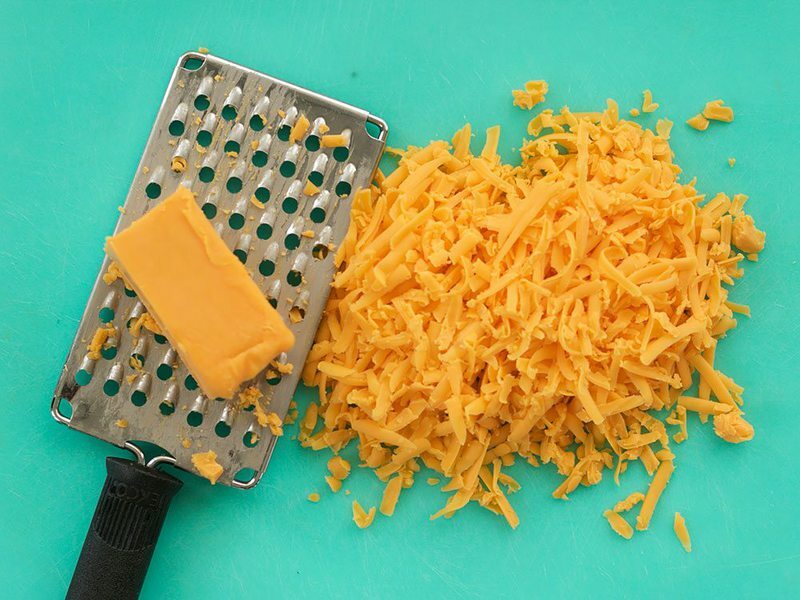 Shred the cheddar cheese. 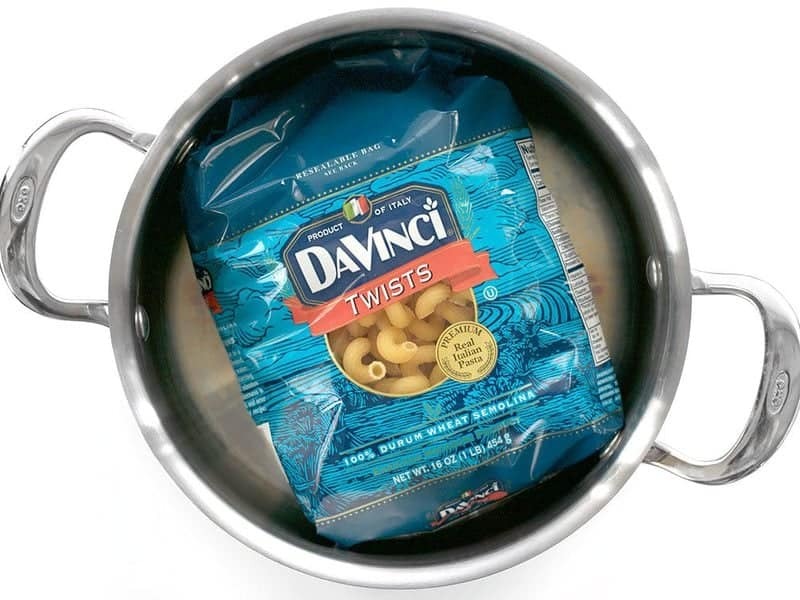 Cook the pasta according to the package directions (boil 7-10 minutes, or until al dente). Drain the pasta in a colander and set it aside. Return the pot to the stove, add the bacon, and cook over medium to medium-low heat until the bacon is brown and crispy (about 5 minutes). 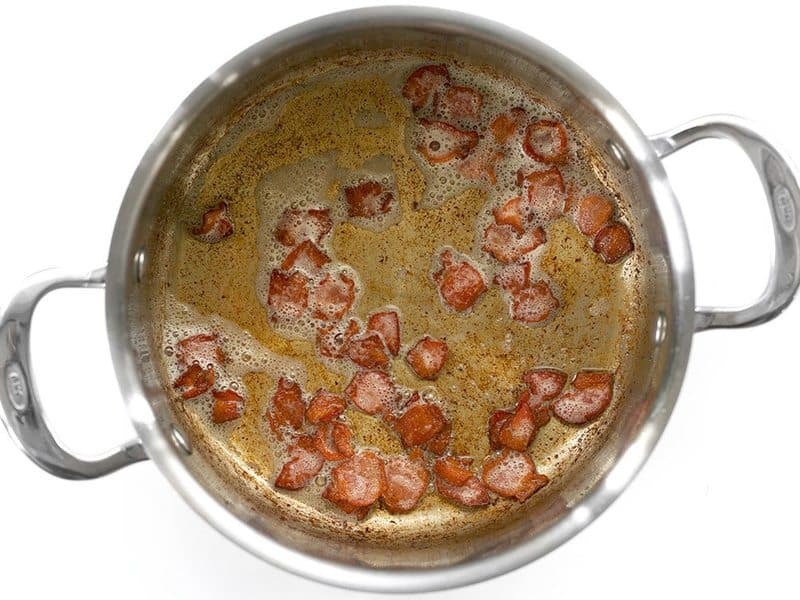 Use a slotted spoon to remove the bacon from the pot, leaving the grease behind. Add the evaporated milk, smoked paprika, Dijon, hot sauce, and salt to the pot with the bacon grease. Stir to combine and allow it to heat through (it should heat quickly as the pot will be very hot from cooking the bacon). 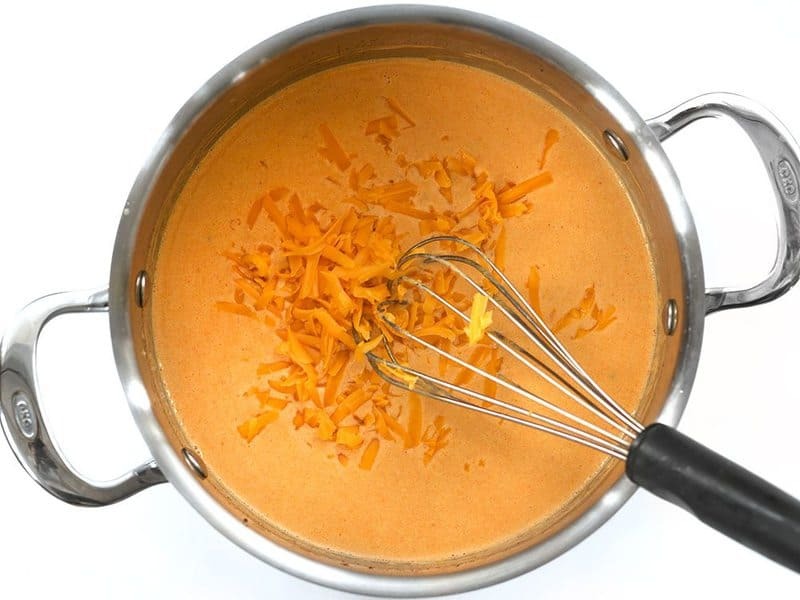 Once the evaporated milk is hot, turn the heat to low and begin whisking in the shredded cheddar, one handful at a time, waiting until the cheese is fully melted before adding the next handful. Once all of the cheese has been melted into the sauce, taste the cheese sauce and adjust the salt or hot sauce if desired. 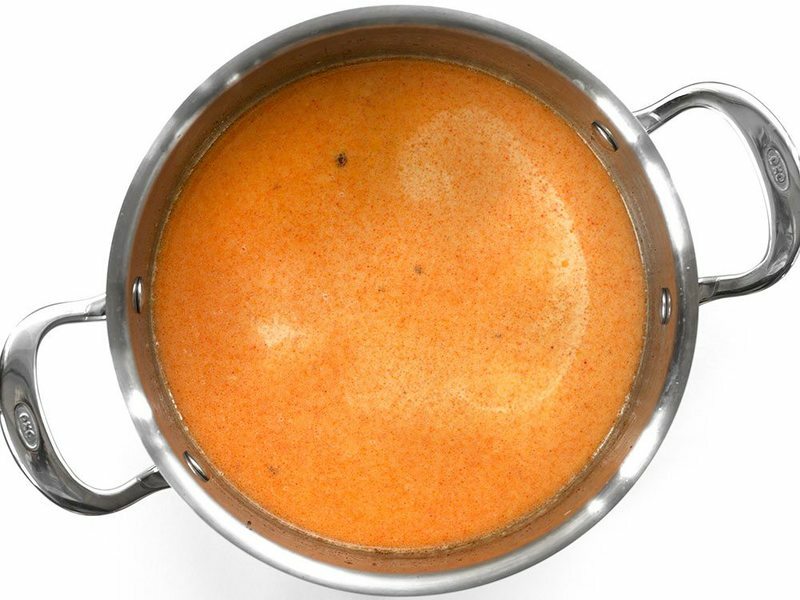 If the sauce becomes too thick, simply stir in one to two tablespoons of the remaining evaporated milk in the can. 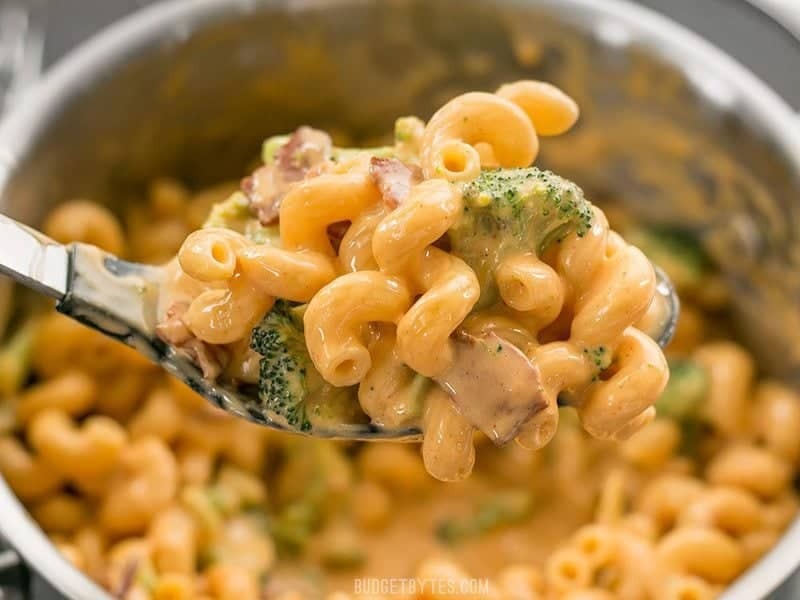 Return the cooked pasta, crispy bacon (crumble into smaller pieces if desired), and chopped broccoli to the pot with the cheese sauce. Stir to combine. Serve immediately. 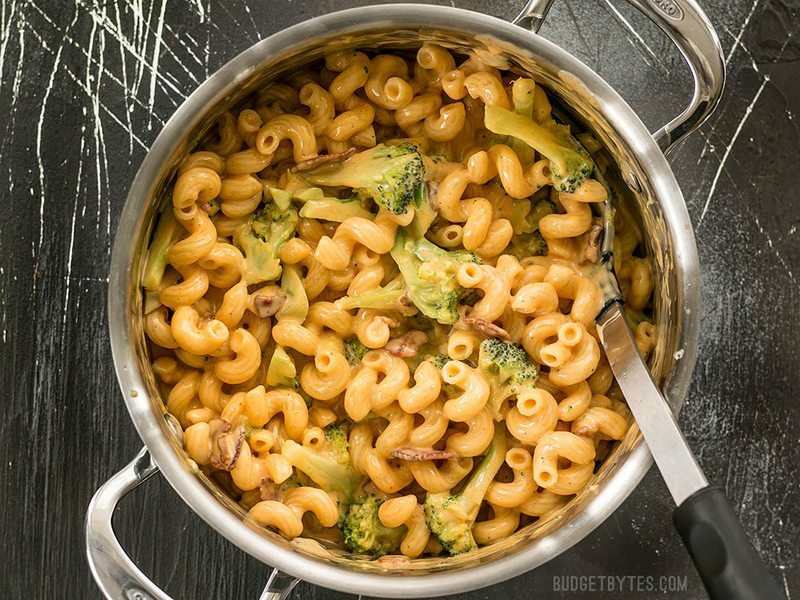 Prepare the ingredients for the mac and cheese before you begin, because the process goes quickly once started. Thaw and chop 1/2 lb. 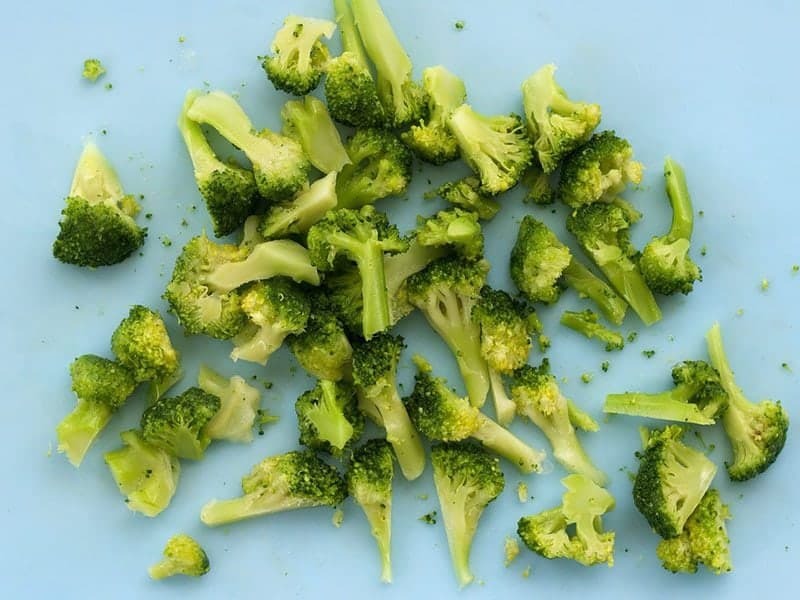 frozen broccoli florets into small bite-sized pieces. Next time I’ll even chop them a bit smaller than in the photo above. Shred 8oz. medium cheddar cheese. Slice 4 oz. 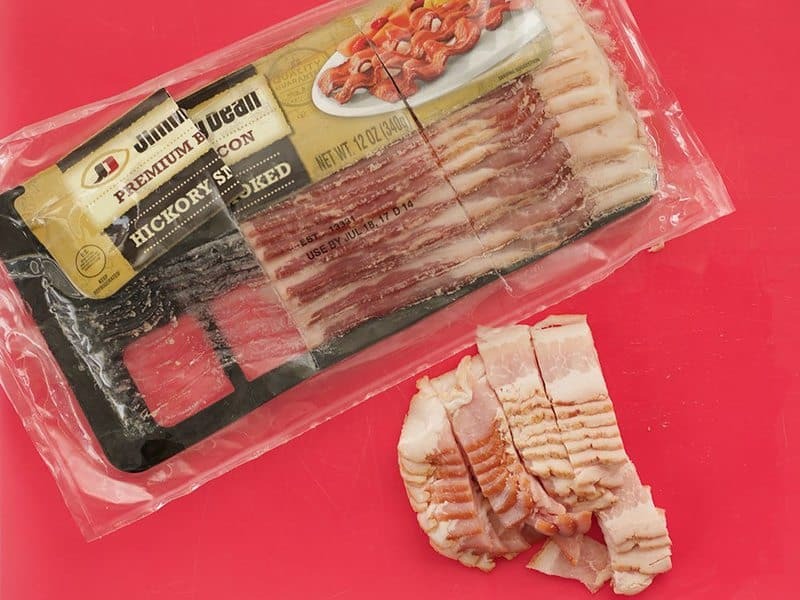 bacon into small strips. I generally only use a small amount of bacon in a recipe (enough to give flavor, but not enough to make the recipe super expensive). So, if I buy a 12oz. package like this, I’ll divide it into three sections, use one, and freeze the other two for later. Cook 1/2 lb. pasta according to the package directions, then drain it in a colander and set it aside (this is a one pound bag, so I used half of it). Return the pot to the stove, turn the heat down to medium or medium-low, add the bacon, and sauté it until it is brown and crispy. 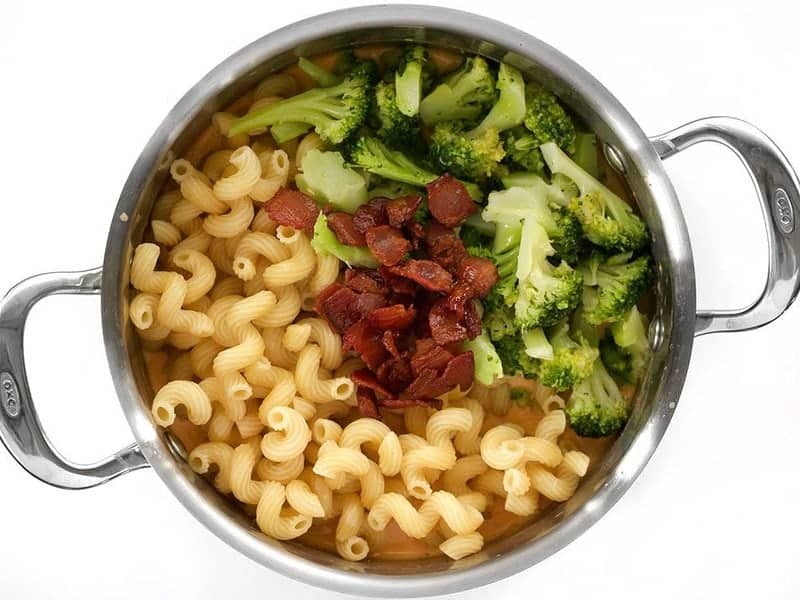 Use a slotted spoon to remove the bacon pieces from the pot, leaving the bacon grease behind. To the bacon grease add 1 cup evaporated milk, 1/2 tsp smoked paprika, 1/2 tsp Dijon mustard, 1/2 tsp hot sauce, and 1/4 tsp salt. Stir to combine and dissolve the browned bits off the bottom of the pot. Allow the evaporated milk to heat through. It should heat very quickly as there isn’t much in the pot and the pot should be rather hot from cooking the bacon. Once the evaporated milk is very hot, turn the heat down to low and begin to whisk in the shredded cheddar, one handful at a time. Make sure the cheese is fully melted in before adding the next handful. 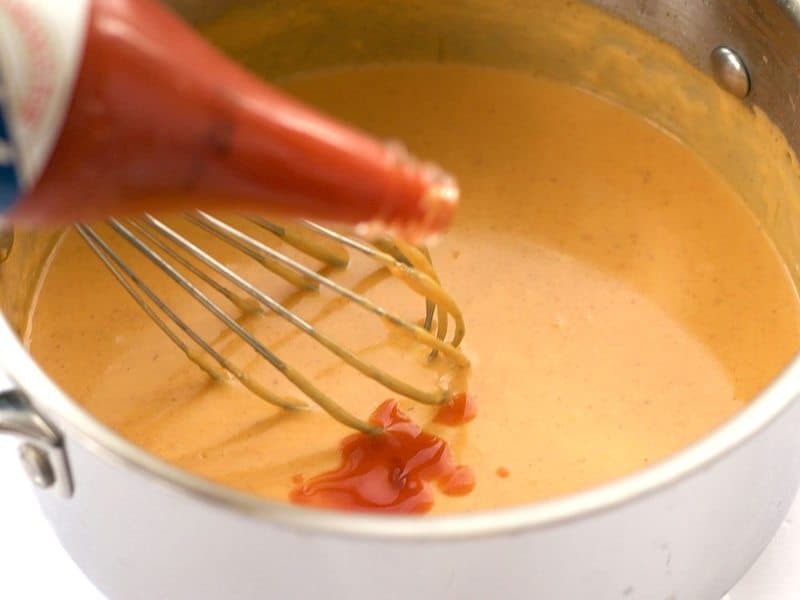 If the sauce gets too thick, add a tablespoon or two of the remaining evaporated milk from the can (there should be about 1/2 cup left in the can). Once all the cheddar is melted into the sauce, you can taste it and adjust the salt or hot sauce to your liking. 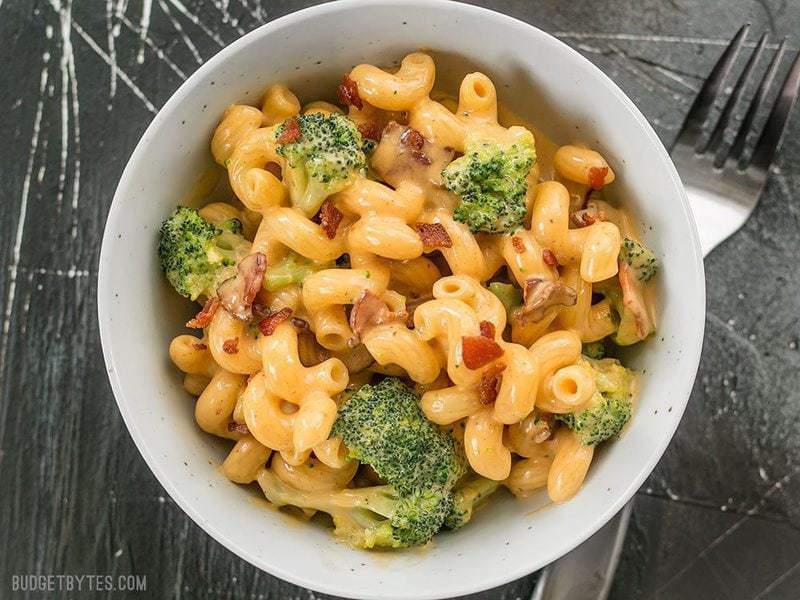 Finally, return the cooked and drained pasta, crispy bacon, and chopped broccoli to the pot with the cheese sauce. You may want to crumble the bacon a little further before adding it back in. Stir until everything is coated in cheesy bacon-y goodness!! And that’s it. 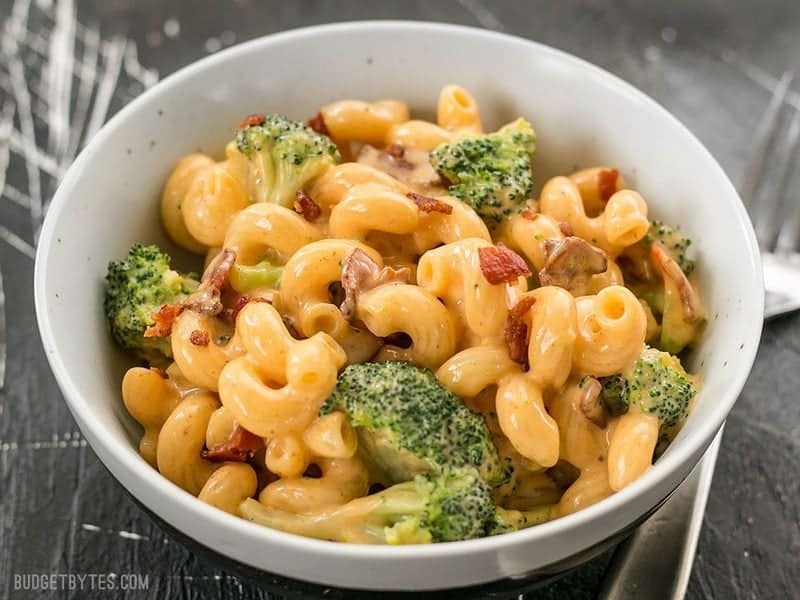 The most delicious One Pot Bacon Broccoli Mac and Cheese EVER. This looks so delish! How would you recommend altering the recipe to use fresh broccoli? The cheese melted nicely into a creamy sauce that tasted good but had a powdery consistency. Any idea why? The bacon I used did not produce much fat. The pot was nearly dry after frying it. Could this be the reason-not enough fat? I shredded cheese from a block of Edam. I’m surprised about the low fat bacon too! Might be a kiwi thing – I’m in NZ. Also, I used room temp, rinsed pasta that I pre-cooked earlier in the day. And because it was cold, I turned up the heat at the end to make sure the whole thing was well heated through. Could either of these have affected the emulsification, or split the sauce? So much for advance meal prep! Not giving up – will try again next week but won’t be too zealous about the advance prep this time. Do you have any suggestions for an evaporated milk substitute? I never have that in my cupboard, would something like coconut milk work? No, unfortunately for this type of cheese sauce it MUST be evaporated milk. It’s critical to making the cheese melt into a smooth sauce instead of clumping up. Evaporated milk is easy to make, assuming you can have dairy. Just gently boil milk on the stove, skimming frequently until you have evaporated out half of the water. I started making my own one time when I was out and continue to do it to avoid unwanted additives like carrageenan. Tastes fresher too, not tinny. I want to make this for a friend and have to make it the day before I give it to her. Does it reheat well? Do you have any recommendations for making it ahead? Thanks so much, Beth!! I love your website! You have helped save us money in our grocery budget!! This was SO good! The consistency of the sauce was smooth and stayed smooth even upon reheating, which I was worried about. Mouthwatering! This was very good and easy to put together. The only thing I changed was using fresh steamed broccoli instead of frozen and it gave a nice crunch with the bacon. For growing up on (and preferring) Kraft, this was a very tasty alternative. I’m cleaning out my fridge/freezer/pantry in effort to get back to vegetarian meals. There is absolutely NOTHING wrong with this- the prep, the scents and the results. So just throwing the thawed, chopped broccoli in at the end will cook it? Frozen broccoli is par-boiled before it’s frozen, so it’s already partially cooked. 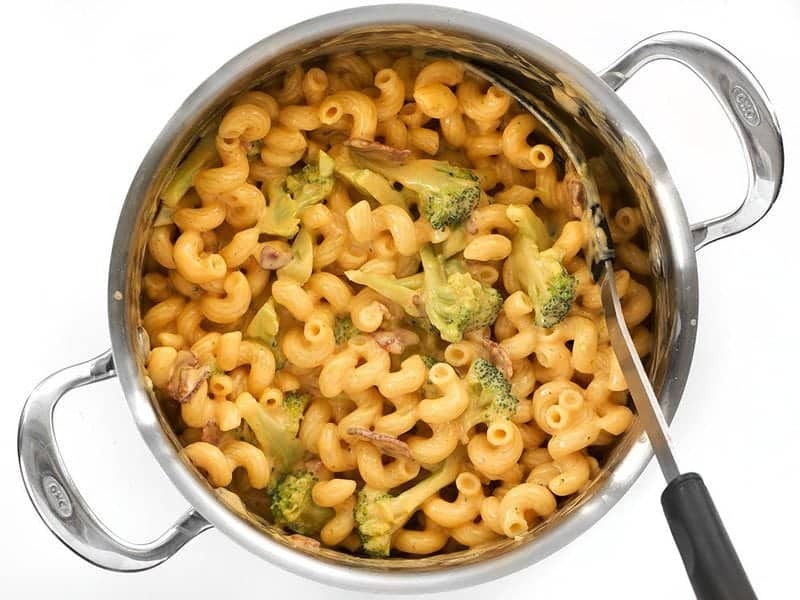 I like my broccoli to still have a little bite to it, so it works for me, but if you prefer your broccoli to be a bit more tender, you may want to add the broccoli florets to the boiling pasta for the last minute or two, then drain them together. I’m not much of a pork eater so I eat turkey bacon. Do you think I should add butter since turkey bacon doesn’t make much grease? Yes, I would. In the non-bacon version of this recipe I use 2 Tbsp butter. 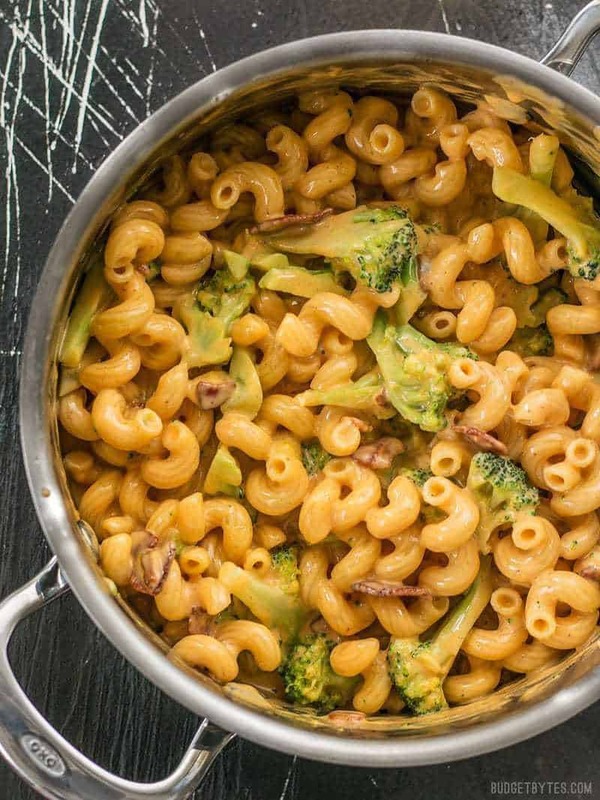 Could you use butter in place of the bacon fat if you wanted to make this veg-friendy? If so, how much would you recommend? Delicious!! Open for customization, a good staple dish! This was great! I just wanted to comment to say I was surprised that my leftovers reheated PERFECTLY! I never imagined that mac & cheese would reheat well, but this one did! I can now add it to my meal prepping list. That’s great to know! I am a college student and was considering making this to eat off of a few meals during finals this week. Looking forward to trying it tomorrow!